Here we go again. Alan and I are cruising the South Pacific for the sixth time. I know what you’re thinking, “Y’all must be crazy.” Well, maybe we are. There will be lots of opportunities for socializing on the deck. The South Pacific is an itinerary that we particularly like for many reasons, especially for the water experiences like swimming with stingrays. 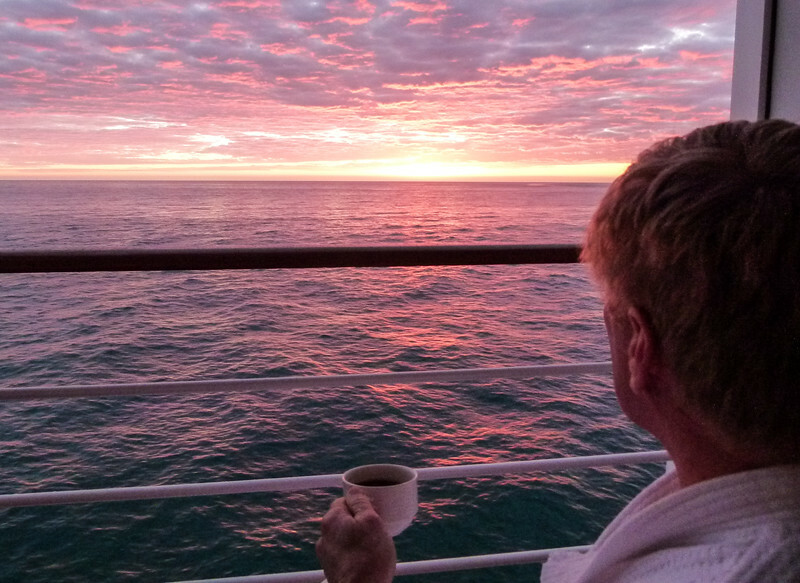 However, it’s the relaxing sea days crossing the Pacific Ocean that really call our name. If you’re looking for an all-inclusive resort on the sea, this is it! Don’t cruise this part of the world before checking out our South Pacific travel planner. The theme name for this trip could be—South Pacific cruise serenity. Not only are we cruising the South Pacific with it’s serene islands, but we’re also trying a new-to-us cruise line and ship—Crystal Serenity. 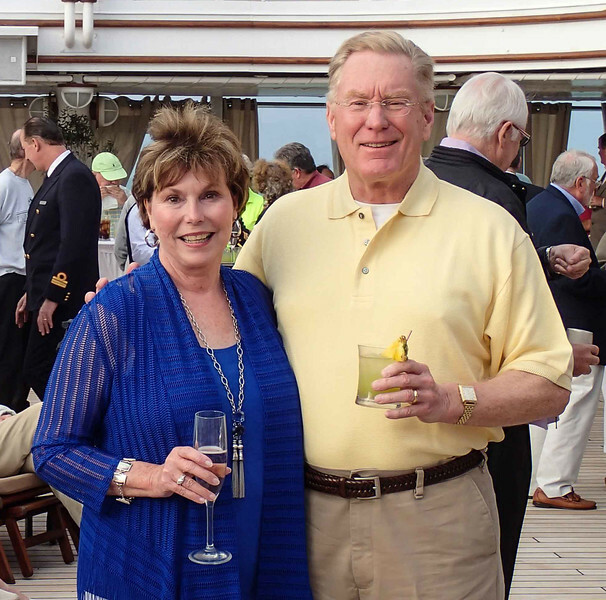 The 980-passenger ship is the largest that Alan and I have cruised on. But the ratio of 1 staff member to 1.5 guests, as well as a 70.3 sq. ft. space ratio, and six-star service promises the type of experience that we expect from a luxury cruise ship. Sunrises on the veranda…here we come! Honolulu, Oahu: Alan previously toured the Mighty Mo and I visited the USS Arizona Memorial at Pearl Harbor. Lahaina, Maui: We’ve enjoyed whale watching and a Lanai Jeep Safari on previous Maui cruise excursions. Fanning Island, Kiribati: Tendering into the lagoon is hit or miss depending on the seas. In four cruises to Fanning Island, we’ve made it to the shore twice. The island offers no services but is well worth exploring to meet the locals and observe a truly isolated location on this earth. Pago Pago, American Samoa: I much prefer cruising to the independent state of Samoa, but Crystal didn’t consult me about the itinerary. On a previous visit, Alan and I took a school bus ride to see the Pago Pago sights. I’m not sure what we’ll do this time. Lautoka, Fiji: This island brings back memories of a wild ride to snorkel at Moon Reef when our cruise ship called on Suva. Although we haven’t signed up for a cruise excursion, the 7-hour tropical island cruise sounds fun. Waitangi, New Zealand: In the Bay of Islands, Waitangi is famous for its treaty grounds and museum, which we’ve already experienced. But Alan and I have plenty of sea days to come up with a plan. Auckland, New Zealand: Since this is our sixth time in Auckland, this may be one of those “get off the ship and walk around” ports for us. From viewing the Muriwai Gannet Colony, to wine tasting, to seeing the city highlights, we’ve pretty much done it all. Waiting for the fun to begin at a Crossing the Equator ceremony. Although Alan and I enjoy the relaxation on a crossing, Crystal has the reputation for offering plenty to do on sea days. Stay tuned as I report back. Better yet, follow me on Facebook, Instagram and Twitter, where I’ll be posting photos and short reports. Of course we’ll be crossing the equator for the umpteenth time. But the ceremony is always entertaining. I’m looking forward to experiencing the Crystal take on pollywogs and shellbacks. When it comes to luxury cruises, dressing up is part of the fun. 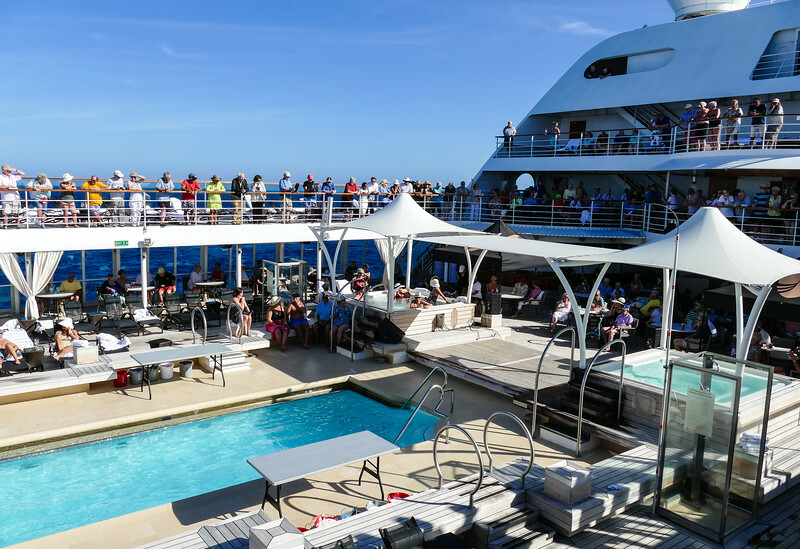 I’ve put my tips for what to wear on a luxury cruise to good use. If the Internet cooperates, I may try a couple of Facebook lives to show you how I’ve mixed and matched new and old favorites. I’ll probably post them on my personal Facebook profile, which is open to the public. And, upon returning from the cruise, I’ll come back here to write a proper review of Crystal Serenity, including my thoughts on the Penthouse with veranda. (I’m usually bad about completing ship board reviews but I’m turning over a new leaf in 2019).